Before I write about Victim, I'd just like to make a few points about this blog, and how much time I spend (or don't spend) on Dirk Bogarde's sexuality, and why. I haven't yet completed all of Dirk Bogarde's autobiographical books, but I think it is safe to say that he spent his entire life publicly denying the fact that he was gay. After he passed away, family members and friends put any speculation to rest and confirmed that the man he lived with for most of his life - Anthony Forwood - was his partner. Because he was so diligent in hiding this, because he denied this part of his life in his books and interviews, I feel strange discussing it here, as if I am in some way betraying the public image that he worked so hard to build. Additionally, I personally don't think that a person's sexuality has any bearing on their art, and as an audience we should only consider it as a tiny fraction of who they are. That so many Dirk Bogarde sites and pages I've found seem to concentrate on his sexuality, I think, is a disservice to his outstanding talent and remarkable career. And lastly, I am colorblind when it comes to sexuality. I don't think anyone should be treated differently because they are straight or gay. Much like you wouldn't refer to Clark Gable as a "white actor", you also wouldn't refer to him as a "straight actor". He's simply, an actor. So it should be for gay actors as well. They are just actors. On occasion, I've received comments on this blog, saying things to the effect of "such a great actor, it's a shame he was gay." Perhaps this is partly why Dirk Bogarde never wanted the public to know. I mean, come on! It's like saying "such a great actor, it's a shame he didn't eat broccoli." It's just a stupid thing to say. 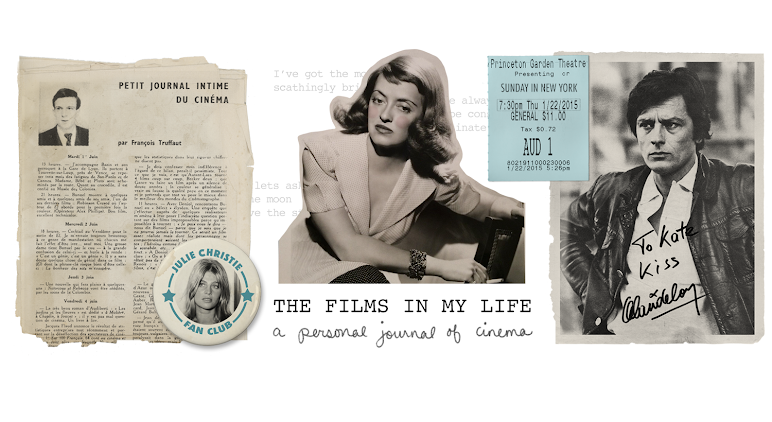 So because I think Dirk would prefer it this way, and because I do not think it relates much to his films, I don't concentrate on that part of his life on this blog. Except for this once. 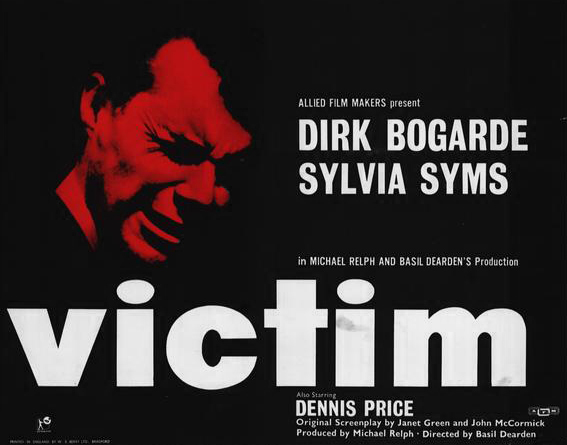 Knowing what we do now, we can say it was amazingly brave and daring of Dirk Bogarde to take the starring role in Victim, a groundbreaking movie from 1961 that tells the story of a barrister, Melville Farr, who sacrifices his family and career to track down the blackmailer that drove his gay lover to suicide. Three other films dealing with homosexuality were released around the same time -- Advise and Consent (1962), The Children's Hour (1961) and The Best Man (1964). None of these films were as raw, stark and brutally honest as Victim. While there are scenes in The Best Man that imply Cliff Robertson's character was gay, they were still dancing around the subject, afraid to even utter the word "homosexual". Victim confronts the topic head on -- and more importantly, confronts the archaic laws in England which made homosexuality a crime. 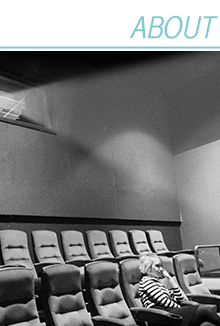 In fact, this film brought such attention to the anti-gay laws, that it is credited with helping to overturn them. I've read many confused articles about this time period in his career, in which some people say that Victim's controversial subject matter cost him his reputation as a matinee idol and giant film star. But this simply isn't true -- one need only look at some of his lighter roles that followed Victim, like the last installment in the Doctor series, Doctor in Distress, to see that his popularity remained. And Victim marked the first page in a new chapter of Dirk Bogarde's career that included a series of edgy, new-wave films like Darling, The Servant and The Mind Benders, which, I would argue, are among his best. Sadly, I think that Victim is still as edgy and avante-garde today as it was fifty years ago. In a perfect world, we should have been able to look back on this bigoted time period as old news by now. 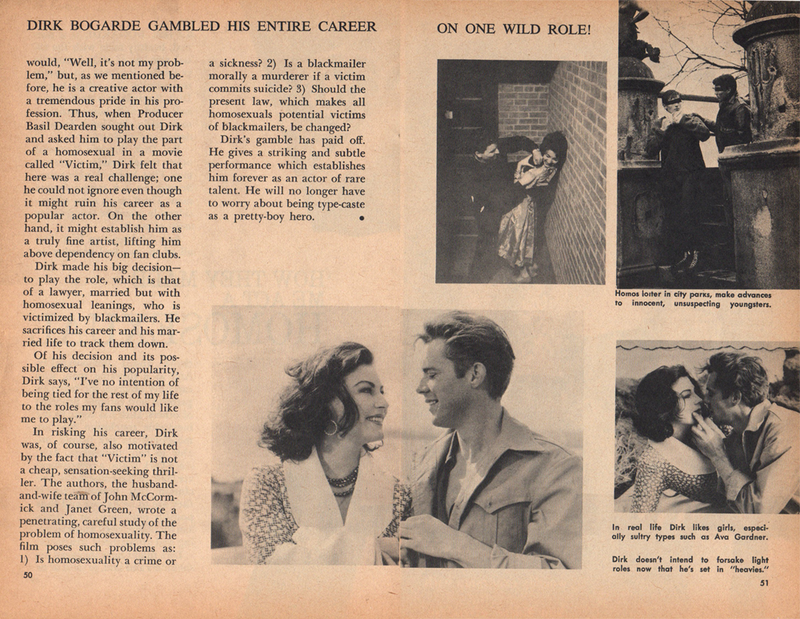 But like Dirk Bogarde and his character Melville Farr, many people still feel the need to hide their homosexuality as if it was something to be ashamed of -- and being "outed" still seems to be something that can ruin a career. While Victim did help to make homosexuality more acceptable (and legal) in the UK, here in the United States homosexuals are still denied many basic civil rights that are granted to every other citizen. I know that most people can't be swayed on this topic, but if anyone is sitting on the fence, I'm sure that watching Victim would help them to come to their senses.